On November 11th 1745, Bonnie Prince Charlie and his Jacobite forces besieged Brampton as they prepared to attack Carlisle Castle and on April 27th 2019 the little Cumbrian market town will again be under siege as hordes of motor sport enthusiasts head into town to see the arrival of the Pirelli International Rally which will feature a high profile finale in Brampton’s cobblestoned market place with the local parish council and the town’s traders joining forces to ensure the event finishes on a really high note. While the main attraction for the crowds will be the competing cars booking in to the final control in front of Brampton’s Georgian Guildhall , with the winners collecting their awards and indulging in the traditional champagne spraying while a giant 60 foot TV screen will replay the excitement from the days frantic action on the gravel stages in the giant Kielder Forest and those who dream of becoming rally drivers can try out a virtual drive in the famous Pirelli Rally Simulator. 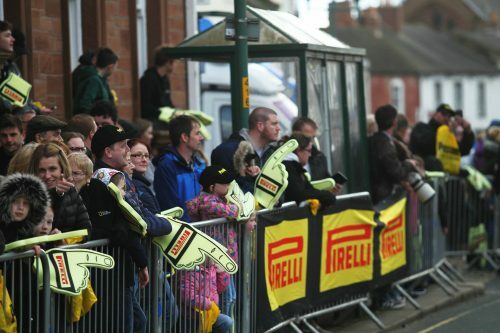 The rally organisers have joined forces with the Brampton Parish Council to ensure that there will be a real carnival atmosphere to the proceedings and the town’s main street, closed while the rally is in town, will feature a host of attractions with children’s entertainers, face painting and displays from a local of military cadets and a display of vintage Land Rovers from CC . Barnetts Garage. The local traders are also enthusiastically supporting the rally ‘s arrival, with food stalls springing up in the main street, renowned local butchers, Cranstons, the historic Howard Arms Hotel and Mrs. Browns Cafe will be setting up their stalls while the Co-op will have a stand featuring a tasting menu, no one is going to go hungry in Brampton !!. Even the local Masonic Hall have chipped in with a donation towards the costs of the day’s events. The Brampton rally celebrations will be getting underway from 4:00pm with the first rally cars expected to arrive at about 6:30 and there will be a full commentary on the proceedings and the opportunity for the public to take photographs, collect autographs and chat to the leading rally drivers. The Brampton Parish Council and local traders are currently ( Until April 17th ) selling raffle tickets offering the lucky winners the opportunity to win a once in a lifetime rally car “Shakedown” ride in Kielder Forest.